One of the ironic facts of modern life is that despite of the technological conveniences which are designed to free up our time, people are sleeping less than they ever have before. A lot less. While medical professionals have for years recommended eight hours of sleep a night, the average American now only gets around six and a half. Maybe that’s why nap cafes and other public nap facilities are becoming a more common sight around the country. Whatever the reason, it seems public perception of sleeping in public is changing. The latest sign of the sleep times comes in the form of the “Airpod,” a personal sleep chamber designed for use in airports. Will nap pods become part of the travelling experience? The Airpod was designed by a pair of frequent-flying Slovenian businessmen who found themselves unable to sleep during the long layovers they inevitably have to spend in airports around the world. The pair designed the Airpod with weary travelers in mind and have been debuting their concept at trade shows around the world. According to their website, the Airpod is “more than just a sleeping pod” and offers a wide range of options to help travelers relax, unwind, and have some privacy in the midst of crowded airports. The Airpod can be equipped with a variety of entertainment and convenience features including Netflix, free wi-fi, device charges, flight info terminals, air conditioning and air purifiers, and of course comfortable reclining chairs which can convert to personal beds. Perhaps most importantly, all Airpods features alarms to ensure travelers don’t miss their flights when catching some z’s on the go. 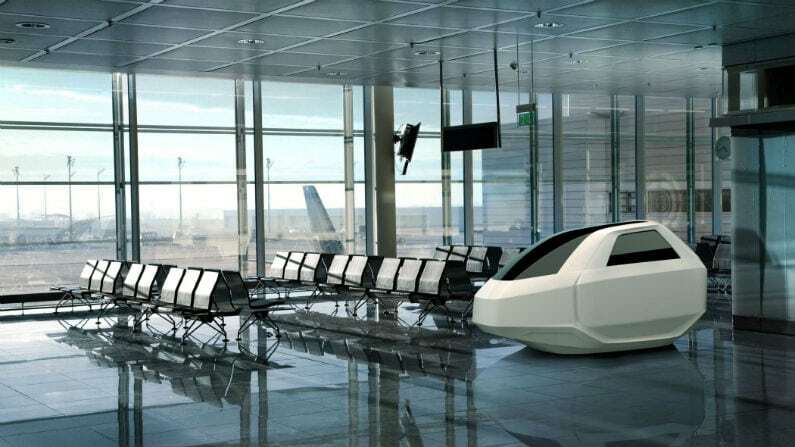 The Airpod is still just a prototype, but the pod’s designers are planning trials to begin later this year in airports throughout the EU. The pods will be available for rent by the hour.